This Large Print Compact edition of the New Living Translation makes it easy for readers to carry Gods Word wherever they go. Attractive Black/Onyx Leather-Like cover. Includes a presentation page, Where can I find it? index, Dictionary/Concordance, and a list of great stories of the Bible. 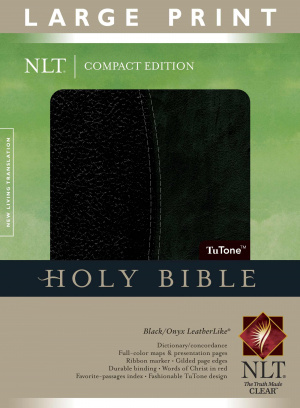 NLT Compact Bible: Black/Onyx, Imitation Leather, Large Print by New Living Trans 2 was published by Tyndale House Publishers in September 2009 and is our 20216th best seller. The ISBN for NLT Compact Bible: Black/Onyx, Imitation Leather, Large Print is 9781414334240. Be the first to review NLT Compact Bible: Black/Onyx, Imitation Leather, Large Print! Got a question? No problem! Just click here to ask us about NLT Compact Bible: Black/Onyx, Imitation Leather, Large Print.